Is It Real, or Is It Miami? Quite a few years ago now, Memorex used to advertise their recording tape (aw ... I'm getting nostalgic) with the slogan, “Is it live, or is it Memorex?” The idea was that the recording on Memorex tape would be so close to the original that you couldn't tell the difference. There's a building going up on the Royal Caribbean campus at Port Miami in which they want to do something much like the Memorex commercial where it will be hard to tell a virtual ship from the real one, except the real one doesn't exist yet. Details appeared in the August 12 edition of Cruise News Daily. Several cruise lines (among other types of companies) use a type of social media marketing to try to get their product in front of groups of consumers who wouldn't normally see it. They do this by finding someone who has a large social media presence, sending them on a cruise with the idea that they will publish something about it, and then it will be in front of all their followers. The attraction is that the cruise line gets their product in front of thousands of people who maybe have never thought of taking a cruise, and it takes a relatively small investment. Carnival Cruise Line has done this before and they will probably keep doing it. CLIA issued the results of a new study about the growth of the cruise industry in Asia, and unless you've been paying no attention at all, the overall result will come as no surprise. Asian business is growing rapidly and showing now signs of slowing down. The surprise is just how quickly it is growing, even taking CLIA officials by surprise. Most of our readers are in North America, so other than as an interesting aspect of the industry, you may not feel that what's happening in Asia is going to affect you much because you usually just cruise in the Caribbean or to the nearby destinations of Mexico or Bermuda. You are wrong, because it's already affecting you. Fleet Week is coming to the Port of Los Angeles. One of the most popular parts of the event will be tours of active navy ships. The event will also feature exhibits, a family STEM expo, military demonstrations, music and entertainment, military aircraft flyovers and fireworks, among other scheduled activities along the Port’s main channel. Tickets for the tours of the navy ships, open to the public for free, are available at www.LAFleetWeek.com A calendar of events is also available on the website. If you live in the LA area, or are planning to sail from the port during that time, this may be a unique opportunity to see the other side of going to sea. Is Princess Missing the Boat? Princess published the results of their seventh annual Relaxation Report, and it shows as many as 40% of Americans take at least five days off work during the year just to catch up on sleep. In this CND article we look at the need for a "Relaxation Cruise" without the normal distractions. For those of you who love trivia and figures, or if you are planning an upcoming appearance on Who Wants to Be a Millionaire, we published Princess' entire press release below. It reveals some fascinating figures about how Americans view relaxation and their vacation time. SANTA CLARITA, Calif. (August 10, 2016) – From politics to work stress, Americans need National Relaxation Day (August 15) more than ever. According to Princess Cruises’ seventh annual Relaxation Report, Americans are using valuable vacation time for things unrelated to vacation such as catching up on sleep and running errands. When it comes to catching more shut-eye, a majority of working Americans (72%) take at least one day off a year just to sleep, and two out of five Americans (40%) take five or more days off per year (a full work week), just to catch up on sleep according to the recent survey by Wakefield Research for Princess Cruises. If they are not using their vacation time to sleep, many Americans are trying to get things done. In fact, 68% of Americans admit they’ve used a vacation day for something other than vacation including family emergencies (37%), doctor’s or dentist’s appointments (36%), sick days for their children or loved ones (31%), home projects (23%) and running household errands (23%) – compared to 2015, when 54% said they had done so. Sadly, it’s no wonder Americans are so tired, vacation time has become hard work. In observance of National Relaxation Day, it’s time for Americans to let go of the guilt and stress they feel when trying to relax, especially when on vacation. Forty-three percent of Americans admit they frequently feel guilty for relaxing, holding steady from 2015. Ninety-one percent of working Americans say they look forward to sleeping while on vacation, but it appears that the stresses of everyday life are getting in the way of a good night’s sleep on vacation. More than a third (35%) of working Americans, including half (50%) of Millennials, often feel more stressed when they’re on vacation because they can’t stop thinking about work. The lack of sleep is even getting in the way of leisure activities with nearly half of Americans, including 65% of Millennials, admitting they frequently skip events or activities on vacation because they’re simply too tired. As one of the world’s leading cruise lines, Princess Cruises, is committed to ensuring its guests come back from vacation feeling refreshed, renewed and rejuvenated. As part of its Come Back New Promise Princess Cruises partnered with leading experts in both the science and beauty of sleep to develop the new Princess Luxury Bed. Together with sleep expert Dr. Michael Breus and designer Candice Olson, Princess Cruises now delivers its guests the ultimate night of sleep at sea. Stress levels are high on vacation in every region except one. Working Americans in the Northeast (43%), West (42%) and South (33%) are significantly more likely to feel more stressed on vacation because they can’t stop thinking about work than those in the Midwest (21%). It’s clear that Midwesterners have no problem relaxing. Most agree (67%) that they never or hardly ever feel guilty about relaxing, compared to an average of only 54% across other regions (Northeast, South and West). When it comes to the differences between the sexes, working women are far more likely (48%) than men (39%) to feel guilty about taking the time to relax. However, among the Americans who take at least one day off per year to catch up on sleep, men take more days than women - 8 versus 7, on average. The role of technology and smartphones seems to have shifted from a source of stress to a source of relaxation over the last couple of years. In 2016, 53% of Americans feel their smartphone makes it easier, rather than harder, to relax, compared to 2014 where 52% felt it made it harder. This year has taken political stress to the next level from the U.S. presidential election to the U.K.’s historic Brexit. In fact, when it comes to Trump vs Hillary, more than half of Americans (54%) say Trump is more likely to keep them up at night, with Hillary a close second at 46%. However, Americans aren’t the only ones in need of a political pause, as 61% of those polled felt that the United Kingdom, rather than Rio de Janeiro (39%), was in most need of a National Relaxation Day this year. One of the best-known names in cruising, Princess Cruises is a global cruise line and tour company operating a fleet of 17 modern cruise ships renowned for their innovative design and wide array of choices in dining, entertainment and amenities, all provided with the experience of exceptional customer service. A recognized leader in worldwide cruising, Princess carries 1.7 million guests each year to more than 360 destinations around the globe on more than 150 itineraries ranging in length from three to 111 days. The company is part of Carnival Corporation & plc (NYSE/LSE: CCL; NYSE: CUK). The Princess Cruises NRD 2016 Survey was conducted by Wakefield Research among 1,003 nationally representative U.S. adults ages 18+ between July 21st and 27th, 2016, using an email invitation and an online survey. Quotas have been set to ensure reliable and accurate representation of the U.S. adult population ages 18+. Results of any sample are subject to sampling variation. The magnitude of the variation is measurable and is affected by the number of interviews and the level of the percentages expressing the results. For the interviews conducted in this particular study, the chances are 95 in 100 that a survey result does not vary, plus or minus, by more than 3.1 percentage points from the result that would be obtained if interviews had been conducted with all persons in the universe represented by the sample. Cunard has always been the line for famous people to travel on because it's one of the few that has always provided transportation - in a very elegant way. (And still does.) Famous people were always spotted aboard the Cunard Queens sailing across the Atlantic, and they still are. Crystal Cruises will be expanding its Crystal Visions enrichment program to Crystal Yacht Cruises beginning in November. Passengers aboard Crystal Esprit will hear experts on global affairs while the luxurious yacht sails in the Mediterranean, the Middle East and to the Emirates. Details appeared in the August 9 edition of Cruise News Daily. Today was a big day for Carnival's AIDA brand. It was the first day of their venture into the Chinese market. AIDAbella will arrive in April, and their advertising campaign broke this morning in China. 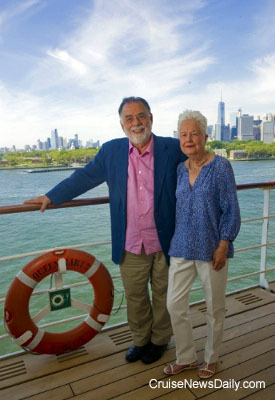 The complete story appeared in the August 9 edition of Cruise News Daily. In many places, there's a legal requirement that COMPLETE election results be published. It usually happens a number of days after the election when the results have been known for some time and the official results are certified, so this huge list gets published in little bitty type, broken down by precinct or something, somewhere near the classified ads. If you seek these out, you will find that not all the votes go to the top two candidates. There are a surprising number of write-in candidates, and one of the top vote-getters in that category is usually Mickey Mouse, with Goofy usually a strong runner-up. Carnival Cruise Line is sponsoring competition for Mickey's write-in candidacy. AIDA's farewell tour for AIDAbella when she's only going to China. An unqualified German man who worked as a doctor on a cruise ship for 10 months, sentenced to three years in jail.